The Profoto HR 5.0' Octa RF Softbox is heat-resistant octagonal light-shaping tool that is ideally suited to groups, portraiture, fashion work, or any field that requires the unique wraparound qualities of an eight-sided light source. 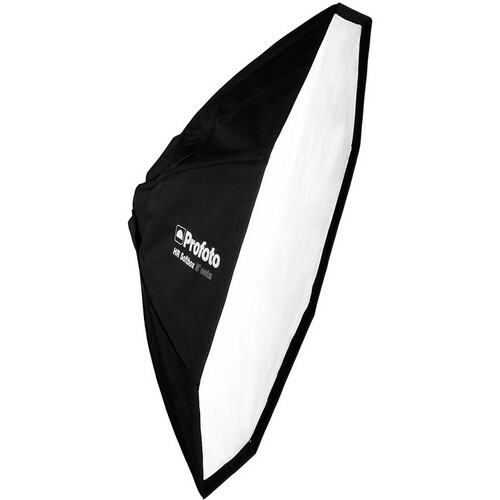 The softbox has removable interior and front diffusers that allow you to vary the amount of diffusion. A recessed front panel lip allows the use of a grid or mask to narrow and control the output. This size makes it a good choice for location work and other applications where a lightweight and compact design is needed. The HR softboxes are compatible with all Profoto flash heads as well as continuous light heads, including the ProTungsten and ProDaylight with a maximum wattage of 1200W. It's also compatible with more than 20 different flash brands through a wide range of optional speed ring adapters. Note: A speed ring is not included. Box Dimensions (LxWxH) 34.0 x 13.4 x 3.4"
What is the real difference between this bank and the RFI bank? They look identical and have similar descriptions. However you could buy two of the others for less than half the price of this bank... Ummmmmm..... Cliff? Heat resistance. The HR octa is made for continuous light which runs hot. The RFi is not recommended for continuous light.